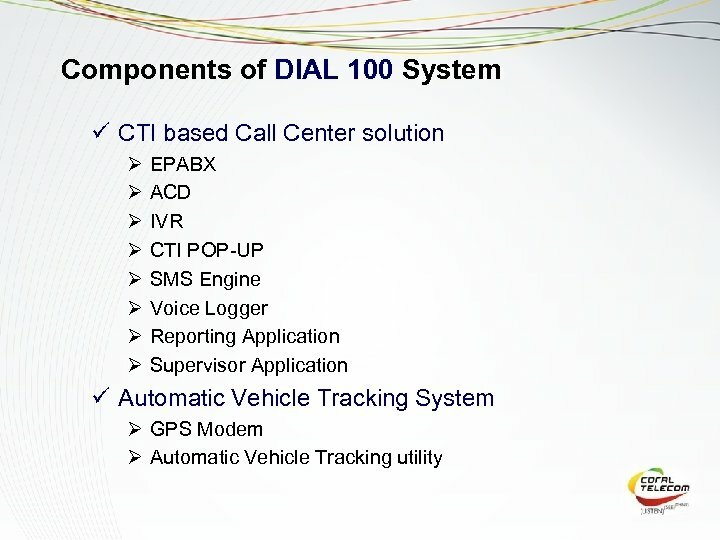 “DIAL 100” is an automated system to handle Public Distress by using PSTN, GSM/CDMA/Wireless Media, CTI based Solution which handles these distress calls efficiently from Police control room, using multiple vehicle mount terminals and GPS based Automatic Vehicle Tracking System for navigation and guidance. 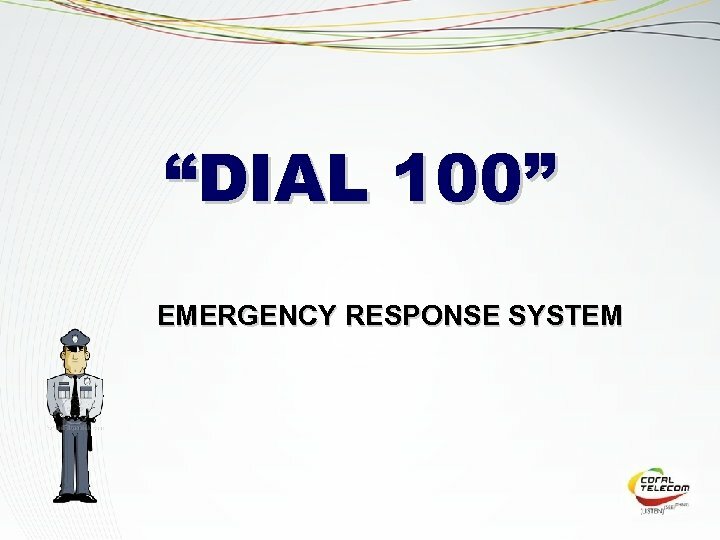 Features Ø Instant response for distress calls made to the Police Department. Ø Logs each and every emergency calls & auto generates FIR. Ø Tracks CLI of incoming call & identifies the address using the database from Telecom service Providers. 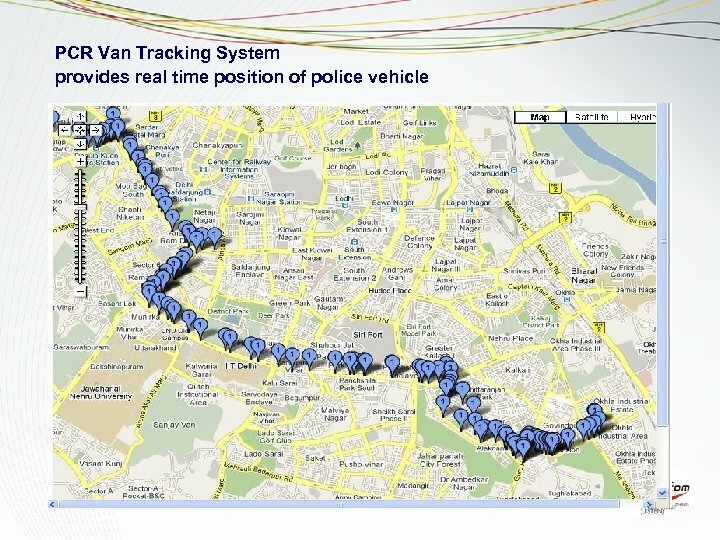 Ø Can track the GPS coordinates of the PCR Van patrolling in that area where emergency has occurred via AVTS (Automatic Vehicle Tracking System). 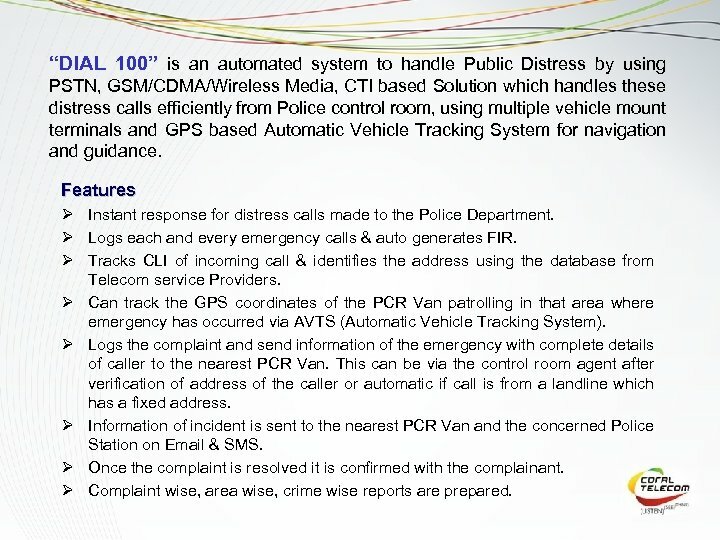 Ø Logs the complaint and send information of the emergency with complete details of caller to the nearest PCR Van. This can be via the control room agent after verification of address of the caller or automatic if call is from a landline which has a fixed address. Ø Information of incident is sent to the nearest PCR Van and the concerned Police Station on Email & SMS. Ø Once the complaint is resolved it is confirmed with the complainant. Ø Complaint wise, area wise, crime wise reports are prepared. 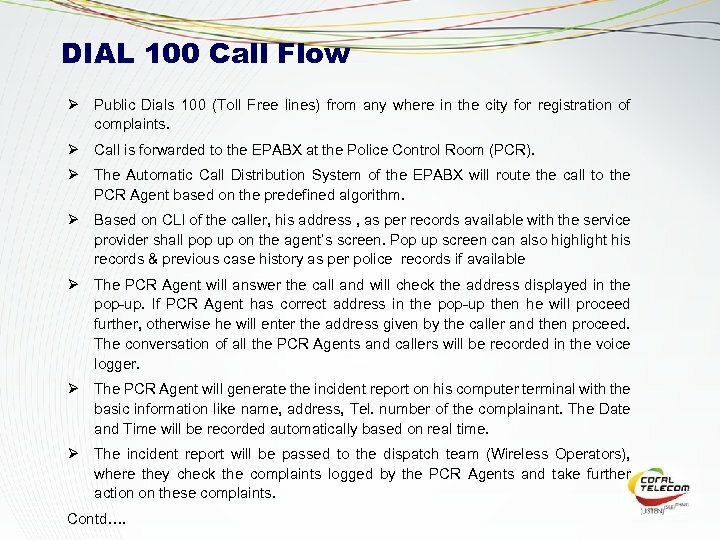 DIAL 100 Call Flow Ø Public Dials 100 (Toll Free lines) from any where in the city for registration of complaints. Ø Call is forwarded to the EPABX at the Police Control Room (PCR). Ø The Automatic Call Distribution System of the EPABX will route the call to the PCR Agent based on the predefined algorithm. Ø Based on CLI of the caller, his address , as per records available with the service provider shall pop up on the agent’s screen. Pop up screen can also highlight his records & previous case history as per police records if available Ø The PCR Agent will answer the call and will check the address displayed in the pop-up. If PCR Agent has correct address in the pop-up then he will proceed further, otherwise he will enter the address given by the caller and then proceed. The conversation of all the PCR Agents and callers will be recorded in the voice logger. Ø The PCR Agent will generate the incident report on his computer terminal with the basic information like name, address, Tel. number of the complainant. The Date and Time will be recorded automatically based on real time. Ø The incident report will be passed to the dispatch team (Wireless Operators), where they check the complaints logged by the PCR Agents and take further action on these complaints. Contd…. 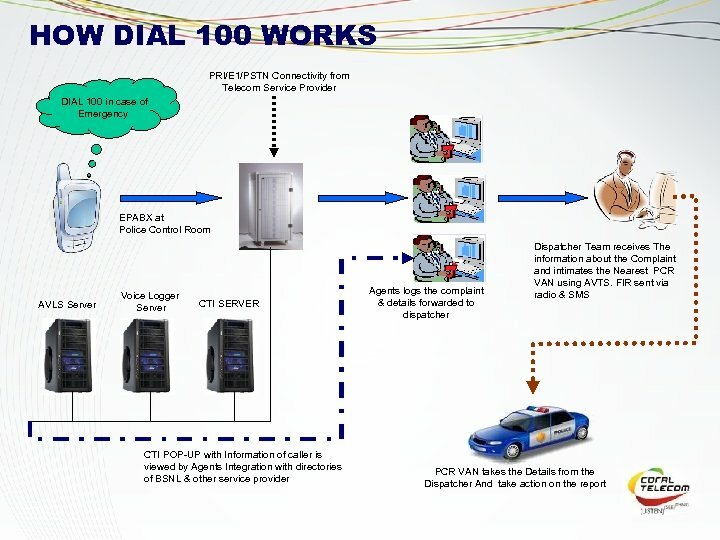 DIAL 100 Call Flow Contd…. Ø GPS receivers at the patrol vehicle will pass their location identity at regular intervals to the base station at the control room using GPRS link provided over GSM network. The Automatic Vehicle Location software will take location identity as an input and will process the same to track the vehicles in the digitized City Map. The dispatcher will locate the nearest patrol vehicles roaming near the "spot of incident". The dispatcher then will direct the patrolling vehicle and police station to take further action using regular VHF / UHF network & SMS. Ø The Wireless Operator will update the Incident Report with the information like the police person to whom the information is passed, vehicle number, police station etc. Ø The Patrol Vehicle / police station gets into the action. Ø Person with the patrol vehicle or police station will get back with the feedback on the received complaint to the dispatcher (Wireless Operator). Ø The Wireless Operator will update incident report and close the complaint. 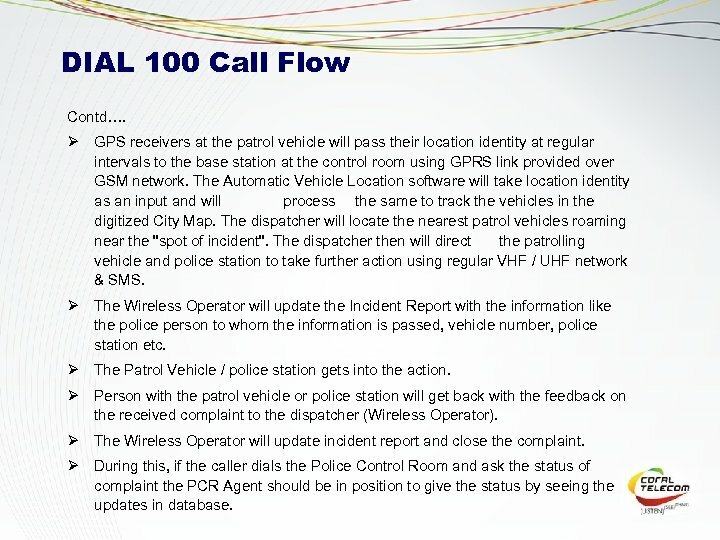 Ø During this, if the caller dials the Police Control Room and ask the status of complaint the PCR Agent should be in position to give the status by seeing the updates in database.